Rather than document more diving on the site, I just wanted to clearly state that, although Sid in reality is one talented hockey player, he is a wimp and wussbag at heart. So with that, may I reprise that special BRETT MCLEAN (FL) vs SIDNEY CROSBY (PITTS) fight on January 3, 2009. Note that as stated in the press post-fight, Brett McLean (FL) was NEVER challenged to fight by Sid the Kid!!? During the faceoff - the KID UNLEASHED. Watch mid-way through the video to the faceoff replay and you'll see that if McLean was ever aware of an upcoming spar with "THE FARRAH FAWCETT OF THE NHL" than he would have looked ready to launch back. There was never any forewarning that they were going to fight. Sid must have been thinking, "Pick a player who's pinky finger brushed up against my hair, and GET HIM WHEN HE'S NOT LOOKING." I am certain the next time he meets Florida, someone will return the favor. Until then, more coverage here, here, here and Fox Sports here. Sid the kid is gonna get run, and run hard next time he sees Mclean. It looked more like Sidney Crosby Vs. Brett Mclean's Jersey. Whatever happened to the good ole days when you squared up, dropped the gloves, lost your visor and threw down? Great pick for the NHL poster boy. A diving pansy who jumps a guy with no rep for fighting and tries to rip his jersey before piledriving him in to the ice. By the time Mclean actually realized he was in a fight (could it be called that? ), he didn't know wether to cover his balls or cover his face. Can't wait for someone to lay this b*tch out and put an end to this over inflated, over extended PR gimmick. Anyone else glad that f*ckin tool of a commissioner is paying such close attention? Rutuu bites someone, Cindys punching guys in the balls and jumping guys off the face off... and Avery gets sent to anger management classes for saying "sloppy seconds". I hear the real reason Chris Simon is playing in Russia is because he refused the Steroids, Caffeine and Shock therapy before every game... and Mats Sundin would have been back sooner, but the league mandated that he complete a sensitivity training bootcamp with Richard Simmons before he'd be eligible to play. Hilarious...so true in both it's humor and truth. Sad really!! 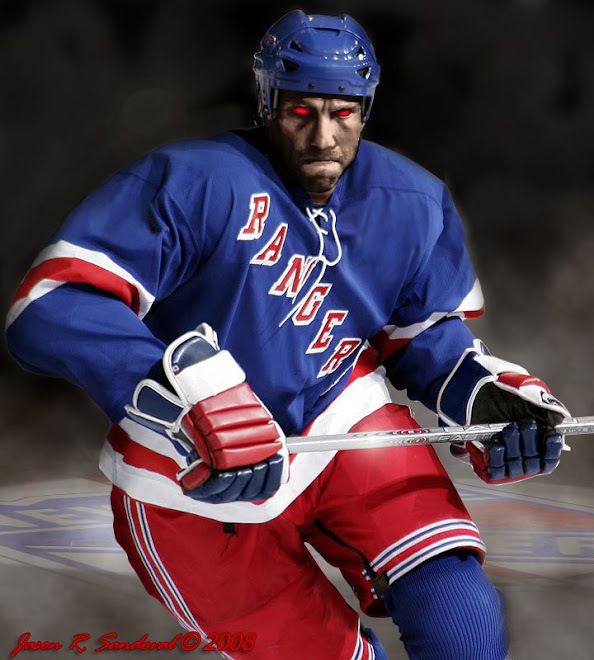 YOU ARE ALL JEALOUS LOSERS AND THE RANGERS CAN ONLY WISH TO HAVE HIM ON YOUR TEAM. ENOUGH. OLD NEWS. LOL, Jealous... He doesn't have guts, tenacity or character to make stick boy in NY. Ovechkin! Now Theres the type of player we can only wish we had.